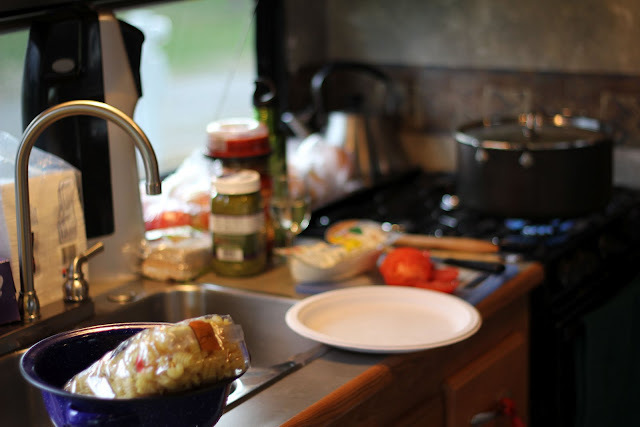 While on our road trip last week, I didn’t have a chance to cook very much other than preparing a few simple meals in the little RV kitchen like scrambled eggs, burritos and spaghetti. I felt like I was playing house! After four days of eating on the road, though, we were delighted to roar into Boulder, CO (remember the broken muffler pipe?) and be welcomed by our dear friends, Elaine and Greg, their two beautiful daughters ... and an amazing meal. 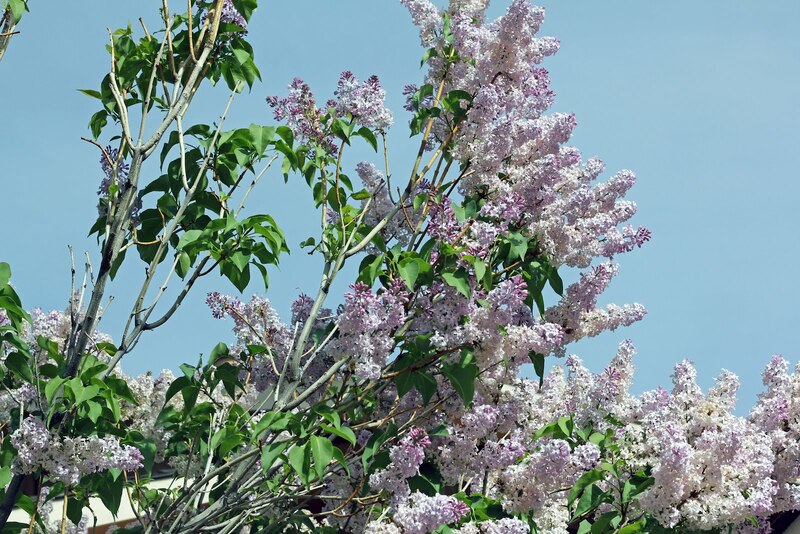 Greg started us off with lemon drop martinis on their deck, where the scent of blooming lilacs filled the air. We then sat down to grilled salmon and veggies, roasted potatoes, and salad with Parmesan and toasted pine nuts – all heavenly, I must say. For dessert, Elaine baked some luscious lemon bars with a creamy filling, shortbread crust and crumble topping. A perfect treat to end the meal! It warmed my heart to see our two families gathered around the table together. Elaine and I met when we were in 9th grade. I had just transferred into our local junior high school and Elaine was a welcoming friend, brimming with kindness and confidence. We began passing volumes of notes to each other in the hallway, and since then ours is a friendship I cherish. Standing in Elaine’s kitchen last week, picking bits of crumble out of the pan together and chatting ... sigh, just like old times. I’m excited to be home again in my kitchen, which to be honest, is not much larger than the RV’s and I love every inch of it. Elaine graciously gave me the lemon bar recipe and I couldn’t wait to bake a pan to share with you. I tweaked the recipe just a bit to include some rye flour, my current favorite I turn to when baking these days. Adapted slightly from Creme de Colorado Cookbook, The Junior League of Denver, Inc.
Preheat the oven to 350 degrees. Butter the bottom and sides of an 8x12 baking dish. Stir the condensed milk, lemon juice and lemon zest together in a small bowl. In a large bowl, beat the butter and brown sugar together until creamy. Add the flours, baking powder and salt. Sprinkle in the oats and, using your fingers, mix until crumbly. Press half of the crumbs onto the bottom of the prepared baking dish. Pour the milk mixture over it and spread evenly. Scatter the remaining crumbs over the top and gently press to create a topping. Bake for 25-30 minutes, until it is set and begins to brown. Let cool and chill for a couple of hours before cutting. 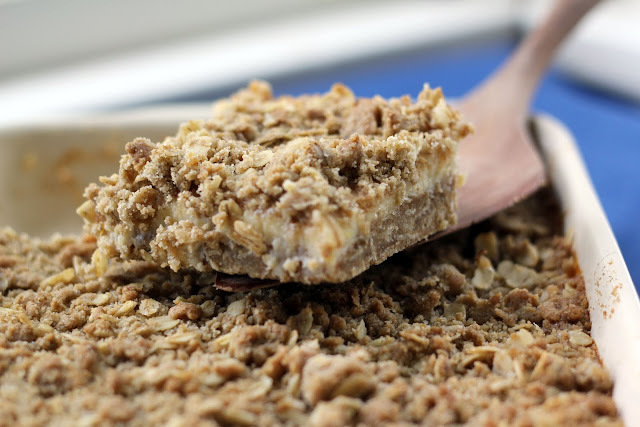 You can prepare the bars a day ahead. I've got a bag of rye flour in the cupboard and this looks like a fantastic way to use it! I just love lemon in baked goods. Even though it's a bit sad that they're not close by, it's fun to have friends in different places around the world. It always makes traveling that much more special. I even had a local tour guide when I was in Paris! Wow, Lauren, a local giving you a tour of Paris sounds incredible! That's always the best way to experience a new place. And if Sam decides to go to CU then I'll be in Boulder more often, and seeing our friends will be an added treat (plus Sam will have a terrific local mom and dad). All good! I hope you enjoy the lemon bars. I'm such a fan of baked lemon goodies, too. Okay so I just drooled on my desk looking at these pictures. These look amazing, and they have oatmeal on them! They are not like any lemon bar I have seen before, and, believe me I have done my fair share of rubber necking lemon bars in pastry cases and on buffet tables. Thank you so much! I thought I'd had every form of lemon bar, too, so it is terrific to discover another one. And yes, the addition of oats was a big plus for me! Any friend who will give you a recipe like that is skirting around "bestie" territory. That Elaine is a keeper! Yum! I've got to make these, Hannah. 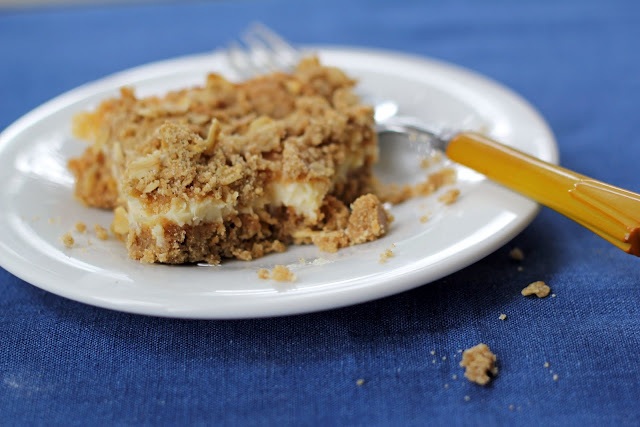 I love any kind of lemon bars, and just love this idea of a lemon crumble bar. I can honestly say I haven't see one like this before! Thanks for this post! Thank you, Susan! I'd never had lemon bars like these before, either. Always fun to discover something new! Lilacs are my favorite flower! Boulder is about a month ahead of us in their blooms, so now ours are starting to bud and I can't wait for the heavenly scent out my window. Sounds like a wonderful road trip! And what a special friendship. 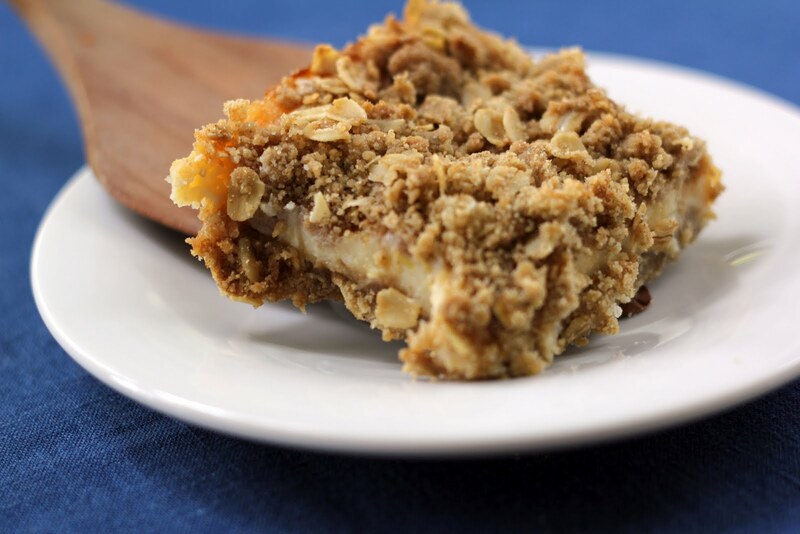 Oh, and these lemon crumble bars - they have everything I love in a dessert bar! Thank you, Katherine! This week I was sad that the trip was over - such a special time with my family and visiting friends. Sigh! Good to know there will be future adventures and visits. If you make the lemon bars I hope you enjoy them! I know they'll be a staple in my dessert making now. I also have some rye flour lurking in the pantry...a result of my flour buying compulsion! So your tweaks make it the perfect recipe for me to use some of it! I am intrigued by your inclusion of rye flour. Although I've used it to make bread, I've not tried it in pastry. How do you think it compares to whole wheat pastry flour - and is there a "flavor"? Hi Linda - rye flour has less gluten than whole wheat pastry flour, so it should be combined with some form of wheat or all-purpose flour when baking with it. Rye flour is mild in flavor and just a little sweet, making it lovely to use in pastry (just tried it in pie dough in a 1:1 ratio with all-purpose flour and liked the results). Let me know if you give it a try. Thanks for stopping by!